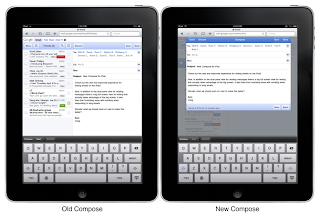 In April 2009, we announced a new version of Gmail for mobile for iOS and Android. Among the improvements was a complete redesign of the web application's underlying code which allows us to more rapidly develop and release new features that users have been asking for, as explained in our first post. We'd like to introduce The Iterative Web App, a series where we will continue to release features for Gmail for mobile. Today: New Compose Interface on the iPad. 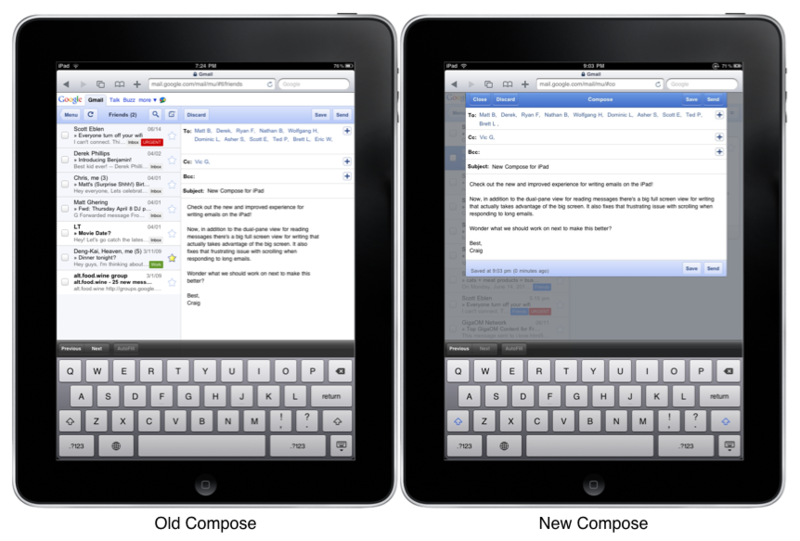 Today we’re happy to announce an improved experience for writing emails on Gmail web interface for iPad. When you write an email you’ll now get a big full screen compose window instead of splitting the screen between your inbox and the compose view. More text is visible at once and there are no more distractions with messages on the side. We’ve also fixed problems that prevented scrolling on long messages. Thanks to everyone who reported the issue via the ‘Send feedback’ feature at the bottom of the screen. We’re continuing to experiment with the large touchscreen and tablet form factor so send more feedback if you have suggestions. To try out Gmail on the iPad, just go to gmail.com in Safari. Please note that the new interface is only available in US English for now. 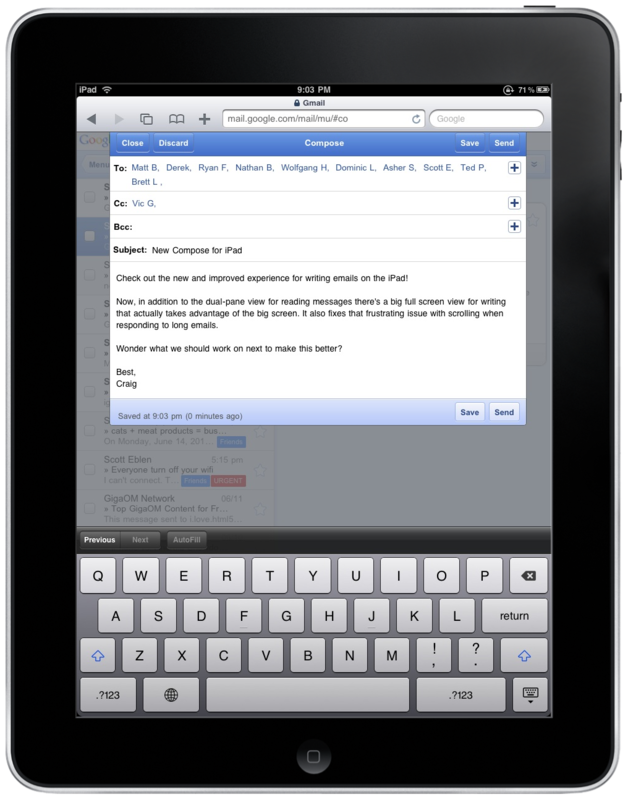 That's pretty nice - but gmail works on the iPad... how about getting docs working on the iPad? What about it working on the new iPhone? Nice work! Hey, will you guys chat with the Google Reader group please. :) Reader needs an iPad version ASAP. I really wish Google Reader worked better on the iPad. I use this both on iPad and on my BlackBerry Bold. What does the new compose window look like in horizontal orientation? I lol'd at the email from Scott Eblin about "turning off wi-fi". I recently installed reeder, which is an app that syncs with google reader. Works pretty well for me. Like half the previous comments are asking.. Please fix Reader for iPad! I LOVE reader.. but hate it on the iPad..
More people use email that some of the other services, perhaps this is why more focus here. Gmail for ipad definitely still a work in progress - inline html's don't work well. For me, replying to thread conversation brings up problems - some parts of the conversation cannot be accessed (less on iphone). Enough that for me gmail on ipad is not useful. Using mail.app for time being. When u switch to desktop ver, performance drops down considerably. Anyone know why? Odd, since other sites not using flash seem to run quite well. Yes, Google Docs and Wave !!! For non-cheapskates that have $5, Reeder for iPad works great and syncs with Google RSS Reader. Hi, thanks for the update, it's made such a difference. However one last improvement would be the ability to change the from: email address through the mobile interface (it's in the desktop web app). Is this still possible? Thanks for an amazing app so far, better than unbuilt Mail (on iPad/iPhone) any day. Secondly, - being able to use my Google Docs on my iPad would be AWESOME! Yep, the iPad is great for reading. How crazy is it that the Google Reader isn't? Get that fixed not now but right now. How did creating emails, the worst thing to do on an iPad, make the list before fixing Reader??? When will we be able to access all of those nifty new Google WebFonts across all of Google's own applications? I'd love to use some of them in Gmail and Docs. what about Chat? a better notification of new IMs would be good. 2. A way to turn image view on for individual emails, to avoid having to return to the regular Gmail client to do so. We need working access to Google Docs. Google Docs is what you want to work on. You want to deploy iPad access to Google Docs. Google Gocs. Google Docs. Google Docs. Guys, please give me a new google superphone with no carrier interference. The trackball and wireless issues on the N1 plus the screen in sunlight are keeping me from getting one. I want something without any sense/motoblur crap and that is kept current. I am using GMail on iPad's safari from Spain and I tell you, it is not formatted nor optimized at all and don't know what to do to get the iPad optimized layout. I guess it is all a region related issue but I would like to know if there's any way to solve it. Thanks so much, hope it made any sense! P.S. What about creating some ipad.gmail.com link? Could someone tell me how they make the keyboard appear on the iPad when you go into the compose window. Hope this solves the no "tasks" on iPad problem, assume it will. Thanks! I'd like to add to the general sentiment that functioning docs would be amazing! Second plea, please enable reading pane as per iPad on standard pc/Mac. With 24inch real estate there is plenty of potential on my computer. Well done gmail team. When can we use the English (UK) version? Keep the area free from encroaching dross please - we can always choose to see it using your tabs. 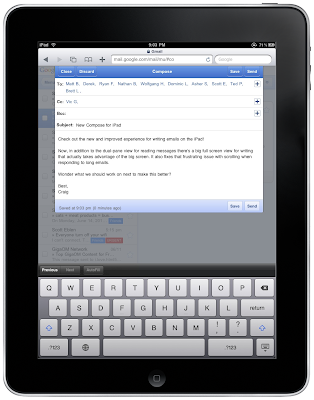 Great the iPad comes along and finally GMail decide to support a tablet style screen. Do they realise tablets have been around for years already? I've had my tablet PC for 4 years, and GMail has always been awful to use in tablet mode. Will this update to GMail be available for anything other than the iPad? Or will I have to make my browser pretend to be and iPad? Why is this only for iPad? It looks like it would be much better on the iPhone as well. Is this just on my device, or does it just work slowly when you type? What is the impression of other iPad users? if you could allow inbox emails to be displayed in full screan in a simmilar way that would be even better, half a screen is often to small to display emails, especially emails with pics like the iStore receipts that i often get. Although it seems like a nice idea, I have noticed that the new "Compose Message" is kind of slow. Whats the poing of doing SO MANY improvements to the Web Apps instead of doing real apps for working on iPhones and iPads... like latitude and an official GTALK for iPhone??? I understand the "war" between Apple and Google but with so many apps mising for iPhone youre not gaining anything. Good job thanks - but as others have mentioned. Google Docs please!